How you plan to use your deck is an important consideration when thinking about the design, creating a practical living area that works well with your home will help you make the most of your sun deck investment. Whilst a good design will enhance the aesthetics, most visitors who imagine themselves using the area will be impressed by a well thought out ergonomic space. Colours are best chosen to either match or contrast against features on your home. If this isn’t possible a suitable contrast usually looks better than a poor match and therefore contrast would be recommended in this case. Fensys have developed its UPVC plastic balustrade colour range based upon contemporary cladding colours and the most popular UPVC plastic window finishes. 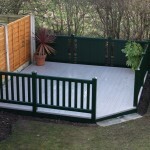 Decking boards such as Tawny, Driftwood and Woodland Green are designed to emulate natural earth tone colours. Walkways should be used for moving between areas. A typical walkway needs to be at least 4 feet or 1220mm wide, where wheel chair usage is expected 1500mm wide is recommended and will allow for better manoeuvrability. Step heights can be adjusted to suit usage or improve access, subject to deck height risers (height of step) are usually between 170mm and 220mm. Tread depths can also be adjusted to suit but are usually between 250mm – 400mm each. Gates with self closing hinges and lockable latches can be added to safe guard children or animals. Veranda style gates are usually around 1000mm wide but can be made a little wider to improve access to desired areas. A small table with 2 chairs and space to walk around will need a deck that is at least 6’ or 1840mm out from the home. A small dinning table with 4 chairs will need 8’ or 2440mm. Consideration should be taken regarding the position of doors, windows and the way that they open in relation to the deck design. A door or window opening into an entrance space or stepped area should be avoided where possible. If you are still not sure, one of our advisors will be happy to discuss your requirements or arrange for a local installation partner to discuss directly. Our installation partners are professional tradesman and will be able to offer practical layout advice and point you in the direct of the most suitable materials. Please click below to visit our design gallery where you will find examples showing some of the most poplar shapes and styles. Fensys UPVC plastic decking materials can be tailored to suit almost any application or design ensuring we can deliver on customer expectations and create an engaging solution.